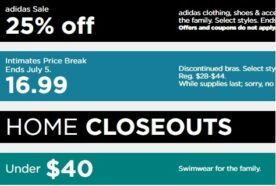 Browse Kohl’s Coupons & Online Promo Codes. 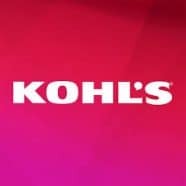 Find the current Kohl’s Coupon Codes, offers & weekly sales, and save money when you use printable coupons and online coupon codes to buy apparel, electronics, home decor, furniture, jewelry, toys, and more. Stock bigger percentage coupons to use all at once when making bigger purchases for maximum savings. 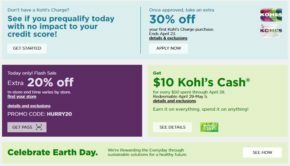 Combine Kohl’s coupons with a price match for any given item and check the terms to see if they fall in your favor for another four discounts on top of the price match. Stock up to four coupons online when you use a home computer (example: 20% off toy coupon plus 20% off storewide coupon plus free shipping coupon). Use coupons on clearance items to purchase a product to your liking at up to 90% off retail price. Connect your phone to Kohl’s Wi-Fi while in store to receive special coupons and reward points. In addition to other coupons, take an extra 15% off entire purchase when you shop Wednesdays at Kohl’s as a senior.